Recent news about the discovery of a zebra mussel in Lake Harriet prompted a flurry of activity at the lake to see if more could be found. Thankfully, after nearly 70 hours of searching, no more of the striped invaders were located. Some of that searching was done by divers who filmed their searches. Although they found no more mussels, what they did find is a bit of a mystery. You can view their discovery on YouTube here. Thanks to MaryLynn Pulscher at the Park Board for the link. The first pavilion constructed at water’s edge burned down in 1903. Perhaps part of that wreckage was simply pushed into the lake. I’ve never seen photos or read descriptions of how any remains of that fire were disposed. Another possibility is that when the succeeding pavilion, which extended into the lake, was destroyed by a tornado in 1925, part of the pavilion was blown into the lake and never retrieved. The new Lake Harriet pavilion, also designed by Harry Wild Jones, and boat dock in 1905. The bandstand seen here on top of the pavilion lasted only one year due to terrible acoustics. It was moved to the east side of the lake at 46th Street where it served as an overlook or “belvidere”. The second pavilion designed by Jones, which extended into the lake, was also rearranged in 1912 and 1913 because it had become unsafe for the large crowds that listened to concerts on the rooftop. The pilings under the pavilion were replaced in 1912 and the pavilion was extensively remodeled. Perhaps debris was left in the lake when that work was concluded. Another possibility could be that a portion of one of the two floating band shells that were used in the early history of Lake Harriet entertainment were sunk there. If the remains found on the bottom of Lake Harriet near the shore were just wood, however, why did they sink instead of floating to shore? It’s hard to imagine someone like park superintendent Theodore Wirth, who served in that capacity 1906-1935, permitting something as unsightly as pavilion wreckage to bob around in one of his lakes until it sank. I would welcome speculation from our many knowledgable readers on what that wreckage on the bottom of Lake Harriet could be and how it got there. Before leaving the subject, I want to express my support and gratitude to the park commissioners and staff who have kept our lakes mussel-free for this long and to encourage boat owners to exercise extreme caution when putting their craft into city lakes. I hope the lone zebra mussel found was an anomaly — as it appears to be. Edina and Minneapolis share more than France Avenue—and history buffs aren’t restricted by city boundaries. Henry Brown played an important role in the history of Edina as well as the history of Minnehaha Falls as a Minneapolis park. There is a Chowen Park in both Edina and Minneapolis. Minnehaha Creek flows through Minneapolis parkland before it gets to Edina — and, of course, all of Minnehaha Creek after it leaves Edina on its way through Minneapolis to Minnehaha Falls and the Mississippi River is parkland. 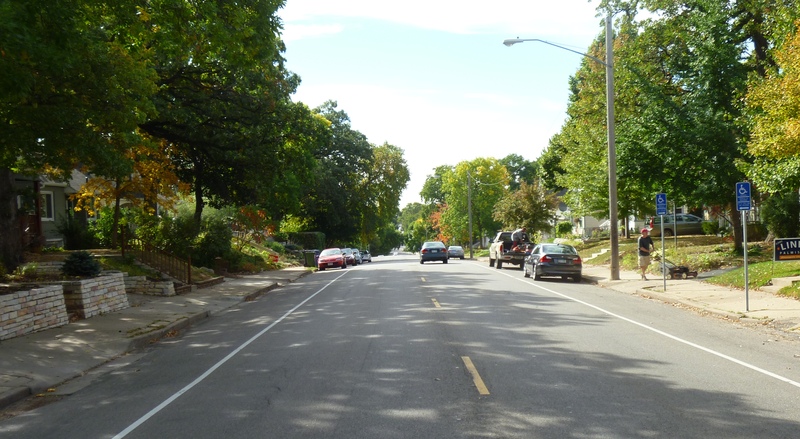 The Interlachen neighborhood grew up around a golf course created by golfers who had outgrown their nine-hole Bryn Mawr course near downtown Minneapolis. That’s just a taste of the rich information on Edina history—and Minneapolis history— on the web site of realtor Ben Ganje. Go to the neighborhood directory on his site then look at the right margin for a list of Edina neighborhoods. Each of Edina’s 45 official neighborhoods is profiled with historical info and interesting bits of trivia. I read about Todd Park because of my interest in famous diva Emma Abbott, a Minneapolis girl made good. Her father was one of those first interested in developing this part of Edina. Why was I interested in Emma Abbott? She was buried next to her husband in Oak Grove Cemetery in his home town, Gloucester, Mass. Their monument is the most impressive in that cemetery, which I visited this fall. Laying out Oak Grove Cemetery was one of the first commissions Horace William Shaler Cleveland received as a landscape architect. He was hired for that job, with his young partner Robert Copeland, in 1854. The next year they tackled the design of the much more prestigious Sleepy Hollow Cemetery in Concord, Mass., the eventual resting place of many of the great writers of early America: Ralph Waldo Emerson, Henry David Thoreau, Louisa May Alcott, Nathaniel Hawthorne and his wife, Sophia, who was a childhood friend of Horace Cleveland. Another Edina neighborhood profile I liked was Creek Knoll, which borders Minneapolis and was first promoted as a residential development for its nearness to Lake Harriet. Also check out the profile of Morningside, a neighborhood that was also subdivided and developed partly because of the rapidly rising prices of residential lots nearer Lake Harriet in the early 1900s. For those of you interested in park history in general, you might want to read about park development at Pamela Park, Bredesen Park and also the land once owned by four-term Minneapolis mayor, George Leach, that became Braemar Golf Course. The Lake Cornelia history also presents some of the challenges of park making as well as stormwater management that face cities as well as suburbs. Can you still catch northern pike in Centennial Lakes? Worth a look if you want to know more about our southwestern neighbor—and our metropolitan area from water management and freeways to shopping centers. The problem with the Xerxes route was that the streetcar company wouldn’t lay track until the street was graded. The city council was willing to spend only $600 for the grading project, so the neighborhood had to come up with an additional $1,600 to do the job. The Fulton association raised more than three-quarters of that sum. The economic success of the campaign to extend the streetcar line — and the Tingdale brothers contribution to the road grading fund that made the extension possible — is highlighted by the fact that a quite large, new Robert Fulton School was built at 49th and Washburn only two years later to meet the needs of the burgeoning neighborhood. The land for Linden Hills Park at Xerxes and 42nd, mostly bog, was not acquired by the park board until 1921 and construction of the park wasn’t begun until 1924. The land for Pershing Field, further south, was acquired in 1922, but construction didn’t begin until 1931. Southwest High School near Pershing Field was built in 1940. Another element in the debate over whether a motorcycle or a horse is a more efficient means of conveyance for park police officers, which I introduced last week in a post about Flying Merkels, is the depreciation of each. I was forced to consider that by an entry in the Proceedings of the Minneapolis Board of Park Commissioners for February 5, 1919. In January of that year a hired horse pulling an ice scraper over the ice skating rink on Lake Harriet had plunged through the ice and drowned. The owner of the horse submitted a bill for $125 to the park board to compensate him for the loss, which the park board paid. But knowing that in 1911 a Flying Merkel had cost the park board $238.50, I wondered if the horse was maybe old and worn out. $125 doesn’t seem like much for a horse; the price must have reflected considerable depreciation. What would a used Flying Merkel have been worth? And were there children skating on the lake the day the horse broke through the ice? Did the ice crack like a pistol shot or simply submerge with a gurgle. Did the horse make a sound or did it confront death with equine-imity? The Flying Merkel would have sunk quickly and quietly—but wouldn’t have been worth a damn pulling an ice scraper. Public-private collaborations that work: Sea Salt, Tin Fish and…Bread and Pickle? The mention of Sea Salt restaurant in Alice Streed’s Minneapolis Park Memory: Treasure (below) is noteworthy. A relatively new development in our parks is mentioned in the same sentences as long-celebrated spaces and activities. The popular restaurant in the Minnehaha Park refectory — run as a private, for-profit business — is a marvelous example of the best of public-private collaboration. It proves that private enterprise can do some things, such as serving delicious sea food, better than a public agency. I believe it also demonstrates the silliness of claims that the sky is falling whenever an agency like the park board considers change. Lest private enterprise advocates get carried away here, however, let me state quite emphatically that there would be no park system in which to place these wonderful little restaurants if we would have relied on private interests to create parks. Our parks prove that public agencies can do some things, such as creating a park system, that private enterprise will not do. The debate over allowing businesses to operate in Minneapolis parks is old — and sometimes entertaining. The park board began granting concessions for boat rentals, then food sales, to private businesses at Lake Calhoun and Lake Harriet very early in the history of Minneapolis parks. The park board assumed control of the boat rentals at Lake Harriet in the late 1880s when Charles Loring noted that the business could be easily managed by the park board. On other issues, however, the presence of private enterprise on park property was vigorously opposed. You didn’t mess with Cleveland’s favorite natural landscapes — one of the things that made him one of the first great landscape architects. Fortunately, William Folwell, who was president of the park board at the time, agreed with his friend. Another early private business on park property was a service to pump up deflated bicycle tires on the new bicycle paths created by the park board during the bicycle craze of the 1880s-1890s. The park board did exercise some control over the business, however, by stipulating that the business could not charge more than a penny for filling a tire. The park board began to take over food service in park buildings after Theodore Wirth became park superintendent in 1906. Wirth, like many park executives of the day, believed that no private concessions should be operated in parks — although he seemed to make an exception for pony rides and probably would have for the polo fields and barns he proposed for Bryn Mawr Meadows. (And, of course, the sheep he brought in to graze at Glenwood Park in 1921 were not owned by the park board. Wirth wrote that he thought sheep grazing in a park was a cool visual effect and that the sheep would earn their keep by cutting grass, keeping weeds down, which reduced fire risk, and fertilizing. Unfortunately they didn’t mow evenly and ate other plants too, so the borrowed sheep were evicted in 1922. ) One of the few other historical examples of a private venture operating on park property was the Minneapolis Tennis Club, which operated first at The Parade and then moved to Nicollet (Martin Luther King) Park in the early 1950s when Parade Stadium was built. Do you remember concession stands in parks? What about treats at the Calhoun, Nokomis or Wirth beach houses? As good as fish tacos? I have high hopes for Bread & Pickle, the new food service contracted for Lake Harriet next summer. I hope the Citizens Advisory Council that worked so hard on the recommendations wasn’t too conservative in forcing a new service into old space.